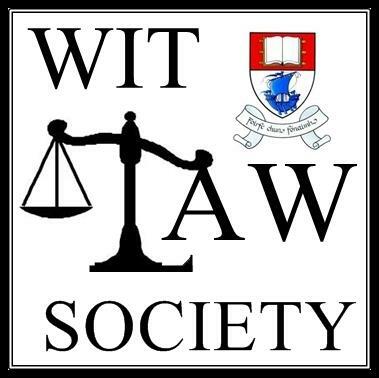 The Law Society is the oldest society in WIT and also one of the biggest and most active. Based in College Street, the Law Society is not confined to law students only but to all those who have an interest in law. The Society aims to runs a large number of events every year which range from debates, moots, talks, careers events, trips and social occasions. Every year, the Society hosts annual events also: the Law Week which offers career advice in all aspects of law, the Law Society Public Speaking Competition, the Humanities Ball in conjunction with the WIT Students Union and other societies and has recently, with the WIT Humanities Department, launched a work experience scheme with local law firms in the region. The Society sends teams to national intervarsity competitions and is planning to host its own intervarsity competition in the coming year. For more information about the Society and how to join, contact Kyle O'Sullivan, President at 0860524890 and also check out our Facebook page. Founded in 1981, The Law Society The oldest and most prestigious society on campus. We have regular events and fundraisers involving all our members such as debates, moot courts and trips to relevant institutions. Annual Law Ball is one the highlights of the college year.